I’ve spent the better part of the past 10 days reading and rereading all the stories posted to this site. Processing the information from each story has helped me to realize just how much help I was able to provide for those who needed it most that day. And every time I read about runners who were lucky enough to finish the race giving away their food, water, Gatorade, or Power Bars to runners who never made it to finish on Boylston, or letting others in need borrow cell phones to try and make sure their loved ones were safe; I think about how crucial it was for me to have finished the race and collected all the food and water that I ended up handing out to whomever would take it, AND the fact that I had my cell phone on me that day and was able to lend it to those who needed it most. Reading and rereading the stories posted to bostonmagazine.com/shoes has given me the strength to finally put together all the puzzle pieces from my Boston Marathon 2013 experience into a succinct narrative that will hopefully provide a similar type of healing that I’ve experienced by reading through the experiences of others on that crazy day. I was a miler in high school. I always ran cross-country to stay in shape for indoor and outdoor track, but my first love was the 800 and the 1600. My times in high school for the 800 were typically around 2 minutes or slightly faster, but my coach moved me up to the 1600 (almost a metric mile) by the end of my junior year because of the endurance I had built training for cross-country. I was able to get my mile time down to the mid-to-low 4:20s and was competitive at all of the meets up to the state championship level. I became injury plagued while running in my sophomore year at UConn and gave up running all together back in 1994. The only reasons I started running again in 2010, nearly 16 years later, was to have some time alone with my thoughts and to get back into shape so that I could fully enjoy my two young boys as they grew up and became more active. Running was much harder than I had remembered it, but as my body became stronger and stronger, I started to challenge myself with longer and longer races. After completing a few half marathons around the 1 hour and 25 minute mark, I started thinking about running a full marathon. Then when I read the sequel to John L. Parker Jr.’s novel “Once A Runner” titled “Again to Carthage,” in which the protagonist transforms from a miler in the first novel to a marathoner in the sequel, my mind was made up. So in spring 2011, after running a 1:25 half marathon on average training, I decided to train for my first full marathon in Hartford later that fall with the goal of qualifying for Boston. When I started training for my first marathon, the ING Hartford Marathon in October of 2011, the qualifying time for my age group (35 to 39) was to run under 3 hours and 15 minutes. Given the results I was able to achieve racing the half marathons with moderate training, I was optimistic at my chances to run under 3:15 at Hartford. Most runners who heard that I wanted to qualify for Boston in my first marathon thought I was nuts and should just focus on finishing. But then what’s the point in setting goals if they aren’t lofty? Then, halfway through that training, qualifying standards were lowered by 5 minutes across the board for all of the age categories, changing my ultimate goal to a finishing time below 3:10 instead of 3:15. Those skeptical runners had jinxed me. With a few minor tweaks to our track workouts over the last two months of training, I was able to run a 3:08 in Hartford at my first marathon and qualify for Boston with just a minute to spare. 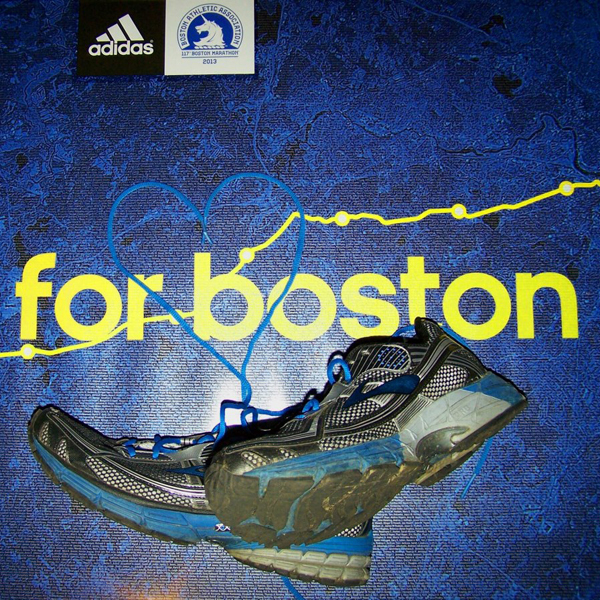 When I was officially accepted into the 2013 Boston Marathon, I vowed it to be my last marathon as my body had never fully recovered from running that 3:08. I also knew that experiencing Boston was something I had always dreamed of, never thought would be a reality, and only needed to do once. Man, did I choose the wrong year to fulfill a life-long dream. My training for Boston 2013 was just good enough to run a comfortable race and enjoy the 26.2 miles of spectators as much as I could. The 3:08 qualifying time I ran was fast enough to get me into the first wave of runners, most of whom were taking the race very seriously and leaving me as one of the few wave one runners that gave high-fives to the kids along the course and ‘thank-you’s’ to everyone that gave me water and Gatorade every other mile for the entire race. I truly treated the race as a party. It was the greatest experience I’ve ever had as a runner, seeing thousands and thousands of runners both in front of me and behind me. I was truly just another drop of water in an ocean of runners competing in the most prestigious and historic road races our country has to offer. Then it happened. The unthinkable. Bombs at the finish line while the true heroes were finishing, those who spent time training hard AND raising money for countless charities. I didn’t think he’d take me seriously. I spent the next 10 minutes calling Dave’s cell as I continued walking down Newbury Street toward Mass Ave., intermittently calling Nima every couple minutes to see if he had heard from Dave yet. It was during one of those calls to Nima that I heard what sounded like a cannon going off in the distance and didn’t think too much of it at the time. I only heard a faint boom in my left ear as Nima was speaking into my right at the time of that first explosion. Then I started hearing people walking by me on the street talk about an explosion at the finish line. Then more people talking about an explosion at the finish. And I still hadn’t heard from Dave yet. This is where my memories begin to become a bit hazy. I remember walking faster and faster down Newbury Street while calling Dave’s cell repeatedly, worrying already that he had listened to my crazy idea earlier about running the entire marathon. When I reached Mass Ave. and still hadn’t heard from Dave, I found an alcove to duck into so I could better hear Nima when I called him to see if he found Dave yet. When he told me that Dave wasn’t back at the car by the starting line either, my focus immediately went to the four women standing in the same alcove, two of which were sobbing uncontrollably while the other two read about bombs that had apparently exploded at the finish line. One of the women was married to a reporter stationed at the finish, and seeing my finishers’ medal hanging around my neck asked if I had seen where the press was situated at the finish. Having just ran a marathon, I was mentally drained and had to explain that I couldn’t remember any details about the finish line and was also trying to locate someone who may also still be around the finish line area. As he finished speaking, I looked out of the alcove I was in to see him just three store fronts down from where I was. He was looking back down Newbury Street, unable to put into words what he thought he had just heard. I told him to hang up because I was walking over to him and didn’t know yet what he had heard or seen about the reported bombs at the finish. Dave quickly told me about the noise he had heard, what turned out to be the second bomb, then immediately started to call and text his family to assure them of his safety. Then we slowly started hearing more and more crying. Then the crying was drowned out by the sound of sirens racing past us toward the finish line. Police cars, ambulances, emergency vehicles, fire trucks, for what seemed like an eternity, racing by us in the loudest, longest, most scary parade we never could have imagined seeing on Marathon Monday. A day that became more and more amazing and inspiring as it unfolded over the 26.2 glorious miles in to Boston turned to chaos. Shortly after the sounds of sirens slowly faded away, we were able to call Nima and tell him that we were both safe, but since all public transportation was in lock-down we would have to start walking out of the city on Commonwealth Ave. as far as we needed to eventually meet up with him. It was then that we, and everybody else still in the downtown vicinity, lost cell phone service and were temporarily in the dark. Dave and I were able to get messages and phone calls through to our loved ones to let them know we were safe, but so many others didn’t have that opportunity. And even though the police officer who saw that we had finished the marathon and directed us to walk out of the city with our phones and food to help anyone that we could, we still didn’t know how much devastation just took place at the finish line we had both ran through and walked away from safely. The feeling of guilt hadn’t yet crept into our brains as we focused on the dozens of runners and spectators who saw that we had finished and were asking us questions and borrowing our phones to try and frantically get messages out to their friends and family at the finish line. Most were worried that the people who came to support them could possibly being among the growing number of casualties and injuries at the finish. While we gave away what food we had left to those runners stopped on the course before finishing and let people use our phones to try and get calls or messages answered, we began to realize how lucky we were to have found each other after finishing and were also able to place a call to Nima letting him know we would be walking out of Boston on Commonwealth Ave. None of our families had come up that day, so we knew they were at home and safe. We knew that it might be a while before Nima could get to us on the only road open to get in and out of Boston, and our mission until that happened would be to help as many runners and spectators as we could by lending out our phones that now had signals again because of the distance our legs had carried us away from the city. We tried to console as many people as we could that were still in the dark about the status of their loved ones at the finish for the next couple hours while we continued waiting for our ride home. The last man to use my phone was worried that the battery was almost drained. He still hadn’t learned if his three young children waiting at the finish line with his girlfriend were safe, and he didn’t want to keep making calls and placing texts. I assured him that I had already called everyone that I needed to and for him to keep trying until he either heard his family was safe or the battery was used up. I never learned his name, but when he finally got a call through to his girlfriend and learned they were all safe I considered him a brother. And if Nima hadn’t pulled up alongside of the road to drive us home almost immediately after the man gave me back my phone, there would have been a stream of tears accompanying the hug I offered that total stranger as we finally left Boston and began our long journey back home.